The RSVP Agency’s Guest Concierge Event Management software will maximise the success of your event. As an organiser, you want to focus your attention on the event itself, not chase after RSVPs. Our email invitation management and event registration tools ensure the highest possible guest acceptance rate. Our professional online event management system has a high email invitation delivery rate. The system handles both SMS reminders and calendar integration using iCal functionality. Knowing your delegates’ preferences and needs is critical to successful event management. Our online registration system ensures comprehensive and accurate guest list information. Email invitations delivered to the right people at the right time. Email invitation templates accommodating any design and ensuring the best first impression. Add personal details to each email invitation; talk to your guests as individuals. Allow selected guests to forward email invitations to their contacts. Great for brokers and sales consultants. Track email invitation bounces and ‘out of office’ notifications to see the status of guests who have declined or failed to RSVP to your invitation. Set up multiple guest lists per event allowing customised communication for VIPs, media, and staff. Identify duplicates in your guest lists, ensuring no guest receives duplicate communication. Data cleansing happens automatically with every list upload. Guest information is uploaded from and downloaded to Microsoft Excel. Quick to configure to meet the pressing deadlines of the eventing industry. Once you have your designs and copy approved, we can send out test invitations within hours. Guests receive iCal reminders with their confirmation email. Event details are automatically added to their diaries. Use the RSVP dashboard to see live reports on guests who have accepted or declined, or have yet to respond. Easily register guests attending your event using The RSVP Agency barcode or cloud registration software. The RSVP Payment Gateway Software is secure, simple and efficient. Features include invoicing, auto-generated unique reference numbers, as well as confirmation emails, payment tracking and detailed reports. Our smart Barcode Software enables event companies to orchestrate discreet and secure registration. Comet enables strict access control and detailed guest tracking. We design custom software applications and features for corporate clients. These include custom feed integrations for SAP, Zapier, and Sales Force, amongst others. We offer a user-friendly Mobile Event App, featuring interactive tools to keep guests informed and engaged. Includes event feeds, push notifications, polling Q&As and more. In addition, guests can easily connect with fellow attendees via in-app messaging. Our online invitations have high delivery rates. They are professionally designed and can be personalised with individual greetings. Each online invitation leads the invited guest through the registration process, which is then stored on our secure server. Live reports provide up-to-date information on guest numbers and preferences. The online invitation management system reminds confirmed guests of your event via SMS. Confirmed guests also receive an iCal calendar reminder that integrates with their local calendar software. The RSVP Agency’s online event registration system can be customised for even the most varied mix of delegates. It provides detailed information in easy-to-understand formats. Capture and plan around the individuality and preferences of invited guests, from dietary requirements to breakaway sessions. The event registration system allows you to save delegate responses and preferences during the invitation phase for later use with your event or conference planning team. The call down dashboard allows existing information to be easily updated should the delegate contact the event organisers by phone. A successful event is a result of one that is well attended but the truth is only 19.7% of emails sent globally are opened so how do you resolve this issue? By choosing The RSVP Agency’s easy-to-use, powerful Guest Concierge Event Planning Software and Email Invitation System, the average open rate skyrockets to 47.21% meaning your goals of achieving a maximum ROI from your event is no longer a dream but a reality. Read more below about The RSVP Agency’s event management software and how it can transform your world as an event manager. As an event organizer, all of your attention should be directed towards the event itself, not the burden of sleepless nights waiting on RSVP replies. An invitation should exude the theme of the event to come and a well-designed invitation is the make or break for first impressions. Our custom designed email invitation templates ensure the upmost success for attendee rate. People don’t want to be another number and in order to make your guests feel as though you took the time to think of them; we at The RSVP Agency give you the ability to add a personalized greeting to each invitation as well as perfect email invitation wording. For simple tracking and organizing, you can now have control by using multiple guest lists to organize all attendees such as VIPs, Media and Staff. 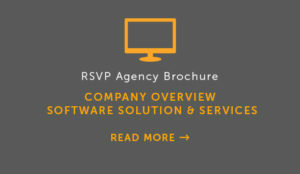 Our team at The RSVP Agency designs custom software applications and features including custom feed integration for our clients. Stay up to date with the event by using our Mobile Event App which includes interactive event feeds, push notifications, our in-app messenger allowing you to connect with other attendees at the event and much more. Our Barcode or Cloud Registration Software allows you to easily register guests to attend your event with the touch of your iPad. Through our Barcode Software, you have strict access control, detailed guest tracking as well as a secure registration. By using the RSVP Payment Gateway Software, you can simply and securely obtain payments using exclusive auto generated reference numbers as well as confirmation emails, invoicing, payment tracking and access to detailed reports. Why Use Our Software for Your Event? From providing custom designed online invitations to RSVP management and user-friendly event registration and more; RSVP Agency’s event planning software makes planning your next event easy and effective. We know that time is money and with our rapid event management setup, as soon as you approve the designs and copy, we will send out test invitations within hours of confirmation. With our sophisticated reporting modules, you can effortlessly use the RSVP dashboard to track live reports on guests’ acceptance, declines or those who have yet to respond. Furthermore, you can easily check the status of guests who have confirmed or declined your invitation as well as ‘Out of Office’ replies and email invitation bounces. 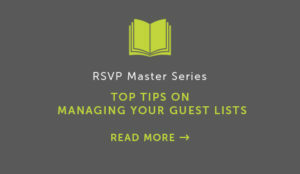 For a no fuss, streamlined management of guest information, The RSVP Agency’s Event Management Software automatically sorts through guest lists in order to fix spelling mistakes, broken email addresses and to guarantee there are no duplicates within your list. The RSVP Agency’s professional online event managed software handles both SMS reminders and calendar integration using iCal functionality ensuring email invitations are delivered promptly to the right guests. Once confirmed, the event details will be added to their iCalendar along with iCal reminders. To ensure added success, all attendees will be reminded a day before the event using The RSVP Agency’s SMS Reminder to ensure a high turnout. By using The RSVP Agency’s Event Planning Software, your chosen guests are able to forward email invitations to others which increases networking opportunities.